Add this vanity to your bathroom for more false style in your home. This set from GLACIER BAY is great for anyone looking for great style and function in their bathroom. The Glacier Bay 30 in. White Hampton Vanity offers great traditional looks in a solid melamine and medium-density fiberboard (MDF) construction. The classic door and drawers are styled to last, and finished in an easy to clean and to maintain bright white thermoplastic material. Nickel-plated hardware is included to add a touch of elegance and the two large drawers with full extension glides offer abundant storage space. Pre-assembled for your convenience, this vanity will provide years of enjoyment in your bathroom or powder room, backed by a limited lifetime warranty. Pair with a matching Hampton Bath Storage Cabinet or Mirror for a great look. Cotherstone 30 inch vanity with thin ceramic vanity top. Two push to open drawers provide your enough space to store the bathrooms items, and very easy to open even if your hands are not available.Drawer organizer inculdes, makes your drawer more tidy, and easy to storeage. Lancaster 36.30-inch W Vanity in White Add this vanity to your bathroom for more false style in your home. This set from GLACIER BAY is great for anyone looking for great style and function in their bathroom. 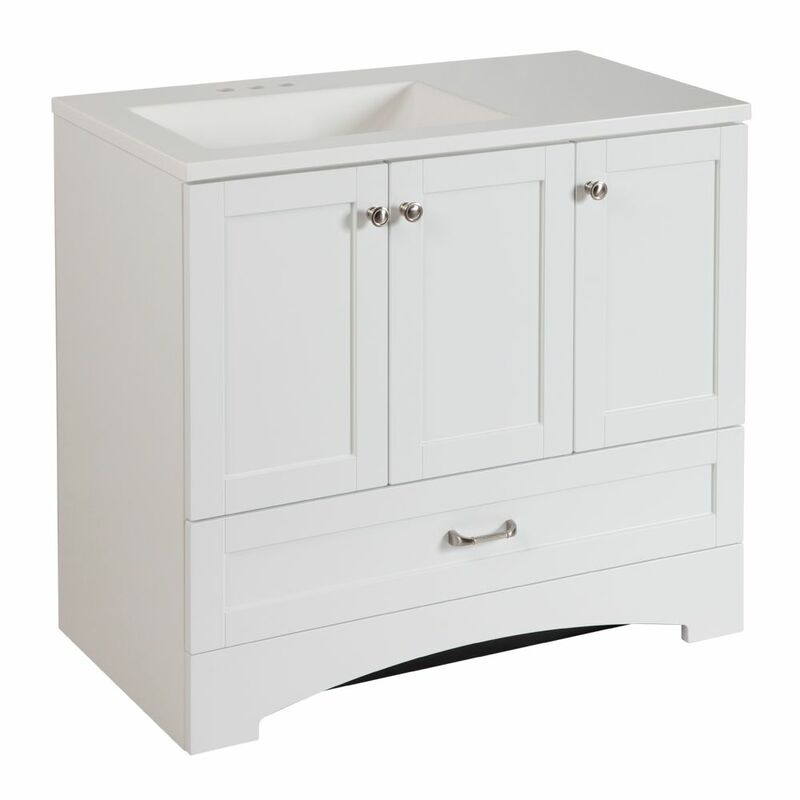 Lancaster 36.30-inch W Vanity in White is rated 4.1 out of 5 by 333. Rated 5 out of 5 by Tamiam2 from Excellent storage capacity! Great vanity! Very pleased with this purchase! Great storage and beautifully designed. Rated 1 out of 5 by Elroy J from I don't like the new model Don't like it, sink isn't centered and the back isn't done for easy install around water lines and drain. Rated 5 out of 5 by Christine from Beautiful! Great hinges, handles and knobs. Love the sink offset to the left. Gives you more room to place your toothbrush etc. Rated 5 out of 5 by n_ashley from Love the offset sink! I am so glad I decided to go with a vanity with an offset sink. I love the added countertop space and this vanity has tons of storage. I thought I was going to need to buy a wall cabinet for additional storage, but I actually don't need to. I also like that there's a pull out drawer in the side cabinet. On a side note, I bought this vanity in store at the Orillia location and trying to get someone to help us was a nightmare. They only had one guy working to help customers load heavy items (on a Sunday!!!). Rated 3 out of 5 by Just me from Looks nice but fragile This was the best option for the space we had to work with. It's beautiful but the counter top is fragile. It already got a small chip in it after a week and it seems to looked scratched all over now if you look close, but all in all it still looks great. It's press board so there are some small fragments all around the top and bottom that show the yellow wood, like little chips. It's not that noticeable, but when you buy something new you don't want to see any imperfections! At the end of day, it still was the best choice. The drawer is nice and closes smoothly and on it's own. Rated 5 out of 5 by Renovation from Better than expected Unit was delivered by polite professional people. Looks great and lots of room for a spare bathroom. Is this available to order with the sink to the right instead of the left? Thanks!